Take control of your climate with eco-friendly cooling systems by MistyMate. 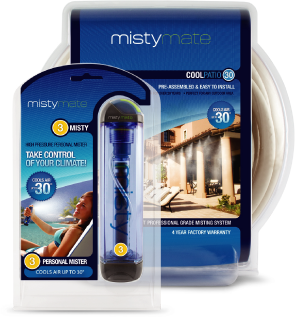 For over 23 years MistyMate has been the industry leader in providing Professional & Personal Misting Systems to help cool your outdoor environment. Upgrade your outdoor lifestyle with the most technologically advanced misting systems on the market today. To learn more about misting systems by MistyMate, visit our MistyMate Cooling Systems webpage or contact your Export Manager.